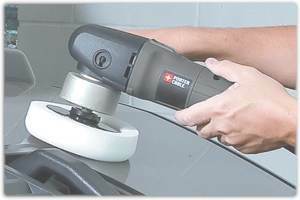 Ideal for polishing and sanding automotive and marine projects, the Porter-Cable 7424XP 6-inch polisher features a 4.5 amp motor for high overload protection and random orbit. It comes with a 6-inch polishing pad. Random orbit, swirl-free sanding/polishing action (view larger). 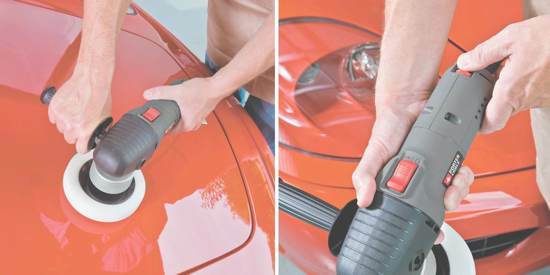 Nicely compact at just 5-1/2 pounds, the 7424XP offers swirl-free sanding/polishing action with an electronic variable-speed dial that operates at 2,500-6,800 orbits per minute (OPM). The 7424XP accepts 5/16 to 24 spindle thread accessories, and it offers a full ball and roller bearing construction for durability under industrial workloads. It features a proprietary counter balance for use with a 6-inch sanding/polishing pad, and it features a two-position (left or right) removable side handle for greater comfort and control. The polisher measures 11.5 x 10.5 x 6 inches (LxWxH). This Porter-Cable tool is backed by three-year limited warranty covering any defects due to faulty materials or workmanship (from the date of purchase). It's also covered by Porter-Cable's one-year free service contract, where Porter-Cable will maintain the tool and replace worn parts caused by normal use–for free. Ideal for polishing and sanding automotive and marine projects (view larger).